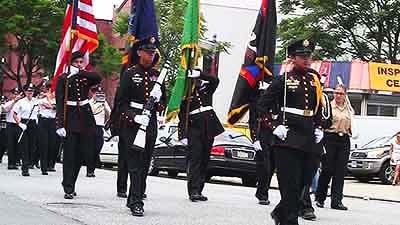 Queens Celebrates Flag Day With A Parade In Sunnyside! Kiwanis-Sunnyside Flag Day Parade Website! The late Joseph Sabba owner of Sabba Printing (and the Woodside Herald) initially served as chairman of the Sunnyside Flag Day Parade (the park where the parade ordinarily concludes is named in his honor - refer to the Parade Info page), as well as the local Sunnyside Chamber of Commerce. (See some great photos of, and learn more about, the history of the Sunnyside Community). 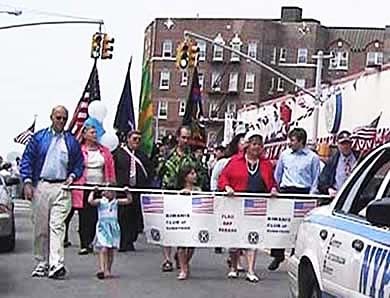 In time, the Kiwanis Club of Sunnyside, a local branch of Kiwanis International, bacame the parade's prime sponsor and remains so up to this very day. Unique In All The Five Boroughs - It's believed that Sunnyside Queens is one of the only communities in all the five boroughs where Flag Day is celebrated with a Flag Day Parade. In addition to sponsoring the annual Flag Day Parade, the Kiwanis Club of Sunnyside provides support and programs for local youth and is just one of the many ways Kiwanis-Sunnyside helps young people of the community. For additional information about Kiwanis International or the Kiwanis Club of Sunnyside please refer to the Contact page on this website. 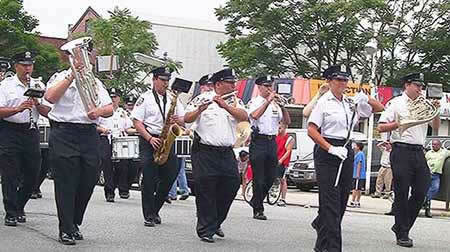 Sunnyside Drum Corps * - The Sunnyside Drum Corps, originally established by Joseph Sabba back in 1977, has been an integral part of the annual Kiwanis-Sunnyside Flag Day Parade. When Joseph Sabba formed the Corps back in 1977 he was looking for someone to be its leader. Mr. Anthony Lana (the tall dude wearing sun-glasses in the photo at the right) voluntered and has been its guiding force ever since. * Headed by Anthony Lana, the Sunnyside Drum Corps is a non-sectarian, not-for-profit, all volunteer, tax-exempt organization dedicated to serving the youth of the community. Join The Parade ! - If you'd like to participate in the parade please download and complete the form on the Participate page and mail it by May 30th to the address indicated on the form. 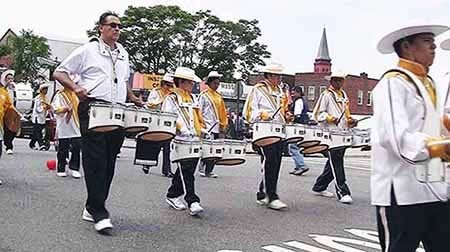 For additional information on how to become a member, add your name to our growing list of parade contributors, or to volunteer to serve the youth of the neighborhood, please call 718-786-4141 during normal business hours. Civic, Community Groups and Businesses - Since the parade's inception many years ago, various local civic and community groups, businesses, and individuals have contributed their time and effort participating each year making the annual parade an exciting and memorable event featuring various marching bands and notable speakers. The NYPD Marching Band (108th Police Precinct) has been a regular performing group for some time even in times of tight city budgets. 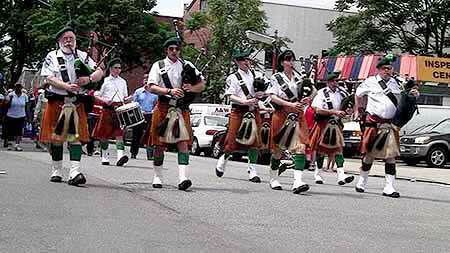 The Pipes & Drums of County Armagh (shown below) is another regular participant in the annual parade and lends the unique charm and sound of bagpipes and drums, not to mention the traditional and colorful clothing of the bagpiper. Go to the Video page to watch this year's Kiwanis-Sunnyside Flag Day Parade (captured in hi-definition and hi-fi stereo surround sound). Check out the Parade Info page for the start date and time of next year's parade. View the current Kiwanis - Sunnyside Flag Day Parade Video!